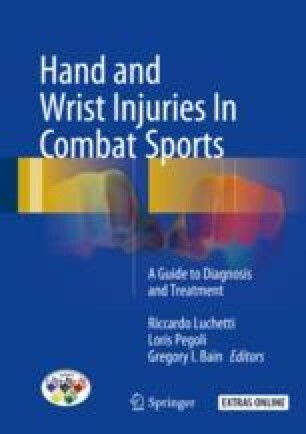 The PIP joint is frequently injured in combat sports and often underplayed by participants, coaches, and medical staff. Outcomes are often poor due to delayed presentation, controversies as to ideal treatment, and technical challenges of repair and reconstruction of the joint. Clinical and radiographic assessment is crucial. If surgical treatment is deemed necessary, the treating surgeon should have an array of strategies in his armamentarium. A thorough understanding of the anatomy and biomechanics of the joint is crucial. Primary aim is for repair of the injury—the method of which will be dictated by the size and quality of bone and soft tissue. Internal and external fixation methods can be used. Reconstructive strategies are often more complex in nature. Salvage procedures should be reserved for cases presenting late or not amenable to repair or reconstruction. Stiffness is common. The goal of surgical treatment therefore is to maintain anatomical reduction and stability yet permitting early range of motion. This chapter highlights these issues the surgeon faces when confronted with these challenging injuries. The online version of this chapter ( https://doi.org/10.1007/978-3-319-52902-8_2) contains supplementary material, which is available to authorized users.